This delicious Strawberry Gelato recipe is a dazzling activity that you can perform in your kitchen. It has perfect texture and it requires just five of the easily available ingredients. This simple recipe doesn’t require any specific cooking skills, so you can easily perform it with cooking’s basic know how. Place 1 pound of fresh strawberries in a colander and rinse them under tap’s cold running water. Drain well and place on a large cutting board. Now use a knife to remove the stems of the strawberries. Discard the stems and place the strawberries in the bowl of an electrical or hand food processor. Sprinkle 1 cup of granulated sugar over the strawberries and start processing at medium speed. Continue processing until the granulated sugar dissolves completely and forms a rich and velvety puree. Top the strawberry puree with ¾ cup of water and process for 3 more minutes until the puree is smooth and watery. Now pour the strawberry puree into a large mixing bowl and set aside to settle down. In another medium mixing bowl, whip the ½ cup of heavy whipping cream with the help of a whisk until it is slightly condense. Add the whipped cream to the strawberry puree and drizzle with 2 tablespoons of freshly extracted lemon juice. Now blend thoroughly until you achieve the desired consistency. Now pour this thick strawberry-cream mixture into an ice cream maker and freeze it as manufacturer’s directions until it forms a rich Strawberry Gelato. Divide your homemade Strawberry Gelato among six to eight ice cream or dessert bowls. Garnish each bowl with a fresh strawberry and mint leaves – of you like. 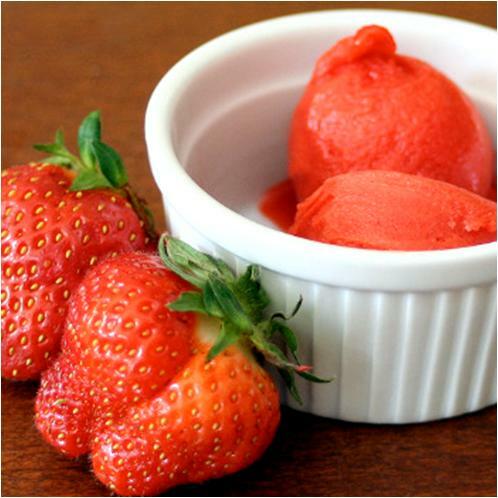 Serve your homemade Strawberry Gelatos immediately and enjoy amazing taste!